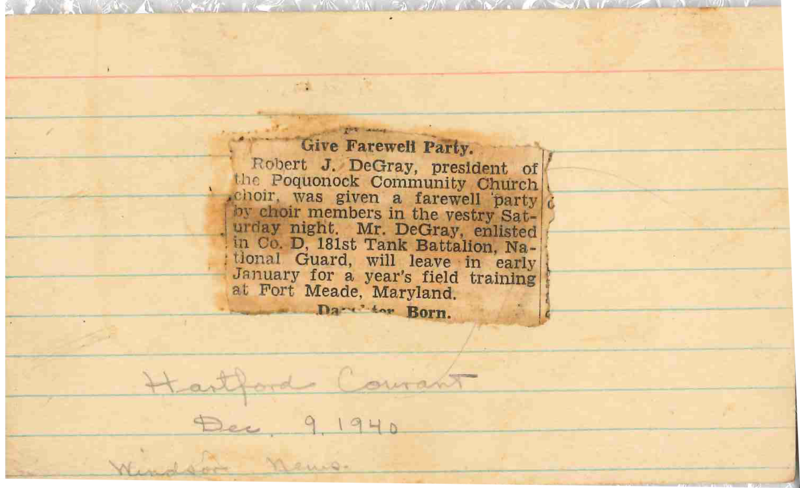 Glimpses into the war service of my father, 1st Lieutenant Robert J. DeGray, one of the 100 million soldiers who served (on both sides) during World War 2. 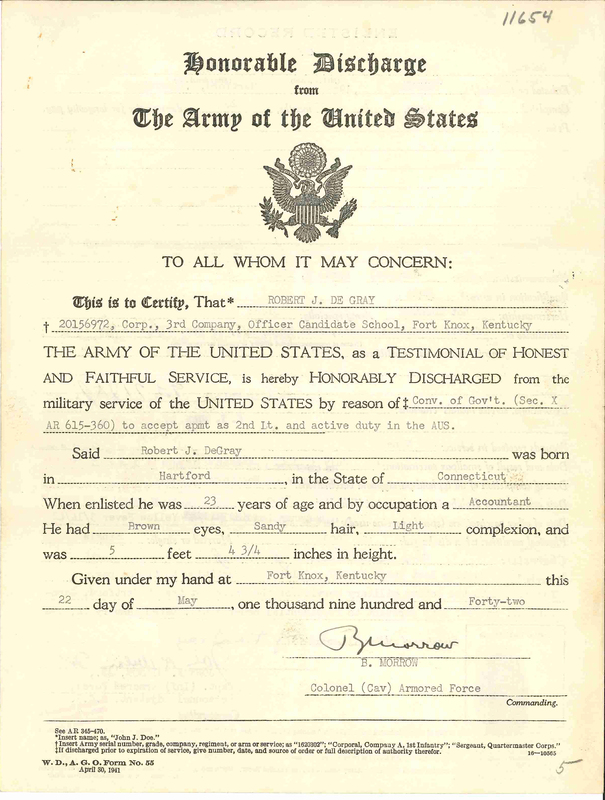 My father served in the Army of the United States from December 10, 1940 to January 24, 1946, with continuing service in the reserves until December 1953. 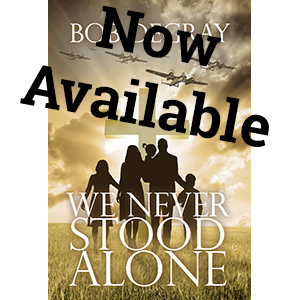 During this time he rose in rank from Private to Captain, served in many roles including as a tank commander in Italy, and received a purple heart. This series of articles will document a few of the key moments in his service career, and attempt to document a few lessons we can learn from his experience. 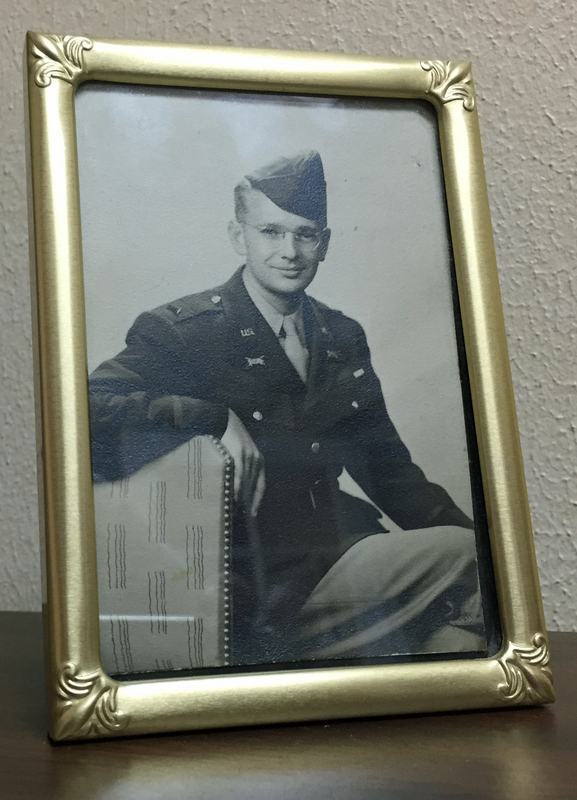 Dad did not enter the service after Pearl Harbor, but almost a year before. 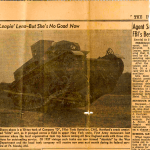 He joined the Connecticut National Guard on December 10, 1940 and was quickly shipped off to Fort Meade, Maryland to train in tanks (see “Kiss the Boys Goodbye” bellow). My dad was 23 years old when he joined up, older than most privates. He had been employed for about five years at the “Norwich Scottish Union,” an insurance company headquartered in his home town of Hartford, Connecticut. When he left for Fort Meade, he made an arrangement with “the Scottish” to hold his job for a year, and he was very concerned that they keep his promise. 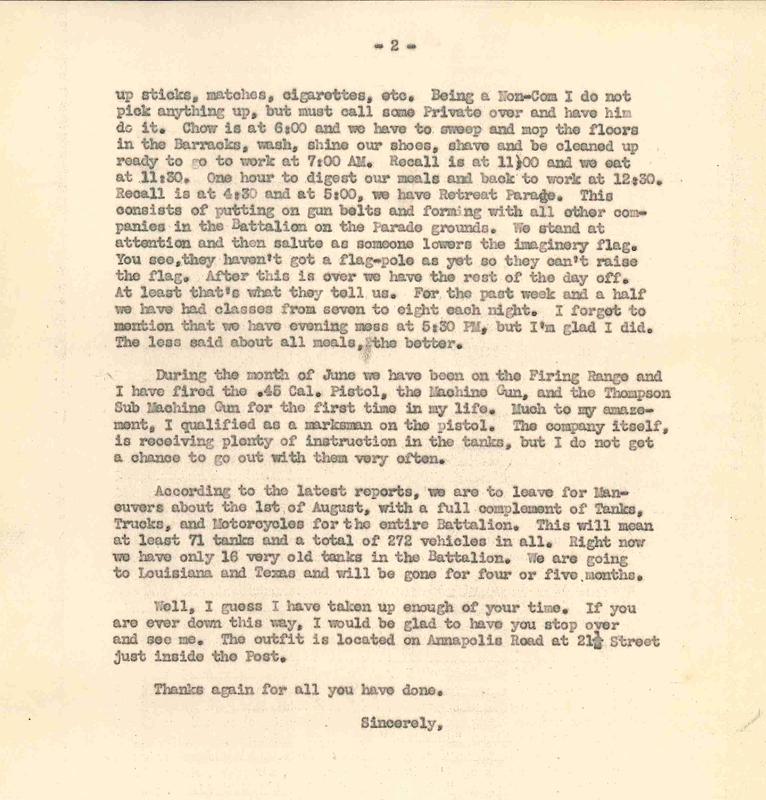 As a result one of the few personal letters in his record is to his boss, Mr. McCormick, dated June 24, 1941. You have probably cone to the conclusion by this time (as we all have here) that the National Guard will be in service longer than a year. All indications are that we will be in for the remainder of the “Emergency.” We’ll be very lucky if we can stay out of the War, itself. Knowing this, and as I have gone as high as I can go in this company, I have written a letter to the Post Finance Officer (a copy of which I am enclosing) asking for duty there. A request for volunteers appeared in the Post Bulletin and it is very likely that I will get the job. 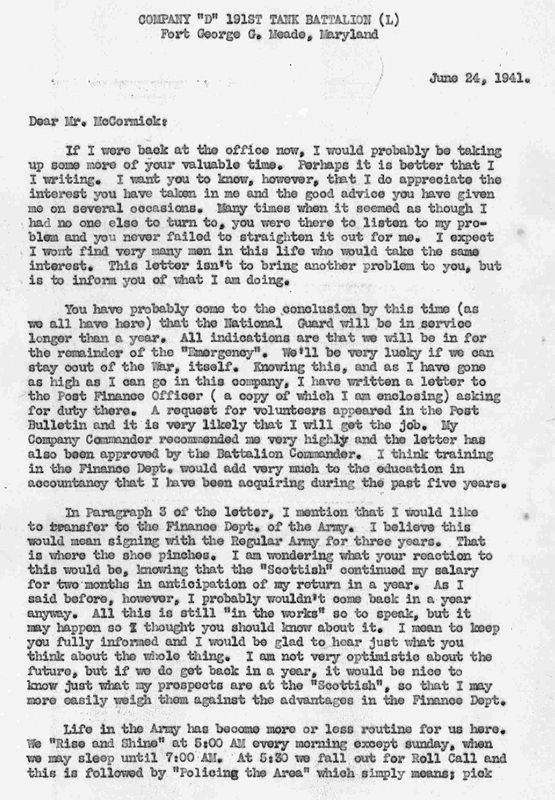 My Company Commander recommended me very highly and the letter has also been approved by the Battalion Commander. I think training in the Finance Dept, would add very much to the education in accountancy that I have been acquiring during the past five years. 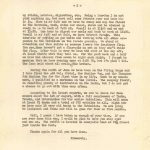 In Paragraph 3 of the letter, I mention that I would like to transfer to the Finance Dept. of the Army. 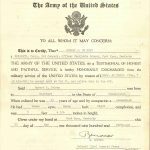 I believe this would mean signing with the Regular Army for three years. That is where the shoe pinches. I am wondering what your reaction to this would be, knowing that the “Scottish’* continued my salary for two months in anticipation of my return in a year. As I said before, however, I probably wouldn’t come back in a year anyway. All this is still “In the works” so to speak, but it may happen so f thought you should know about it. I moan to keep you fully informed and I would be glad to hoar just what you think about the whole thing, I am not very optimistic about the future, but if we do get back in a year, it would be nice to know just what my prospects are at the “Scottish”, so that I may more easily weigh them against the advantages in the Finance Department. 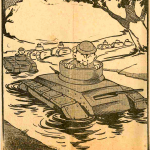 In reality, of course, the war broke out before ‘the year’ was over, and the entire 181st Tank Battalion became part of the regular army. 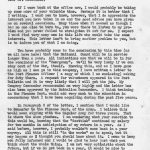 My Dad was a corporal at the time he wrote this letter, but by January 1942 he had been selected for Officer Candidate School, graduating from the accelerated course in May 1942 and receiving the first of three honorable discharges in order to accept the rank of 2nd Lieutenant. 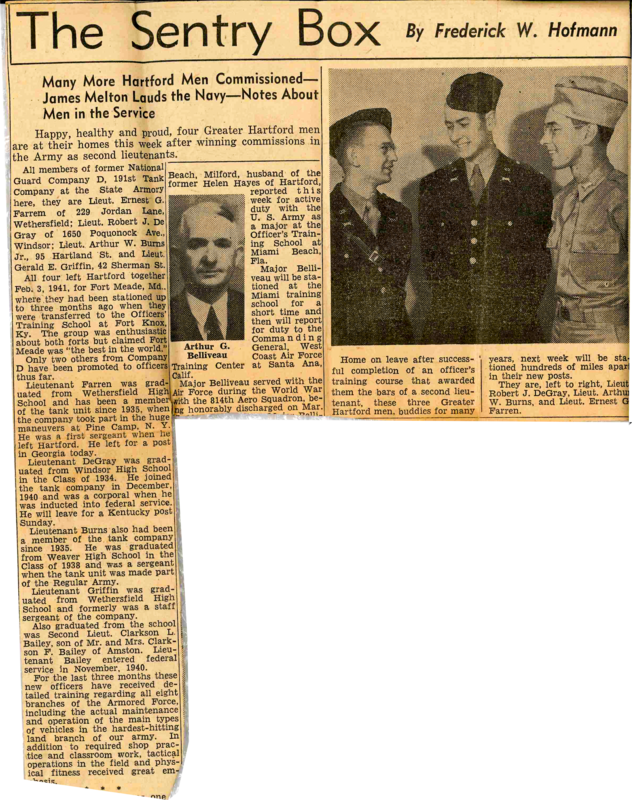 The lesson, which he was already learning, was ‘don’t believe any promises made by a recruiter.’ The state of ‘unlimited national emergency’ declared by Roosevelt on May 27, 1941 was little more than a propaganda ploy, but the one which the attack on Pearl Harbor transformed into a deadly reality. Life in the Army has become more or less routine for us here. We “Rise and Shine” at 5:00 AM every morning except Sunday, when we may sleep until 7:00 AM. At 5:30 we fall out for Roll Call and this is followed by “Policing the Area” which simply means; pick up sticks, matches, cigarettes, etc. Being a Non-Com I do not pick anything up, but must call some Private over and have him do it, Chow is at 6:00 and we have to sweep and mop the floors in the Barracks, wash, shine our shoes, shave and be cleaned up ready to go to work at 7:00 AM, Recall is at 11:00 and we eat at 11:30. One hour to digest our meals and back to work at 12:30, Recall is at 4:30 and at 5:00, we have Retreat Parade, This consists of putting on gun belts and form ng with all other companies in the Battalion on the Parade grounds. We stand at attention and then salute as someone lowers the imaginary flag. You see, they haven’t got a flag-pole as yet so they can’t raise the flag. After this is over we have the rest of the day off. At least that’s what they’ tell us. For the past weak and a half we have had classes from seven to eight each night, I forgot to mention that we have evening mess at 5:30 PM, but I’m glad I did. The less said about all meals, the better. During the month of June we have been on the Firing Range and I have fired the .45 Cal. Pistol, the machine gun, and the Thompson Sub Machine Gun for the first time in my life, Much to my amazement, I qualified as a marksman on the pistol, The Company itself, is receiving plenty of instruction in the tanks, but I do not got a chance to go out with them very often. According to the latest reports, we are to leave for maneuvers about the 1st of August, with a full complement of Tanks, Trucks, and Motorcycles for the entire Battalion, This will mean at least 71 tanks and a total of 272 vehicles in all. 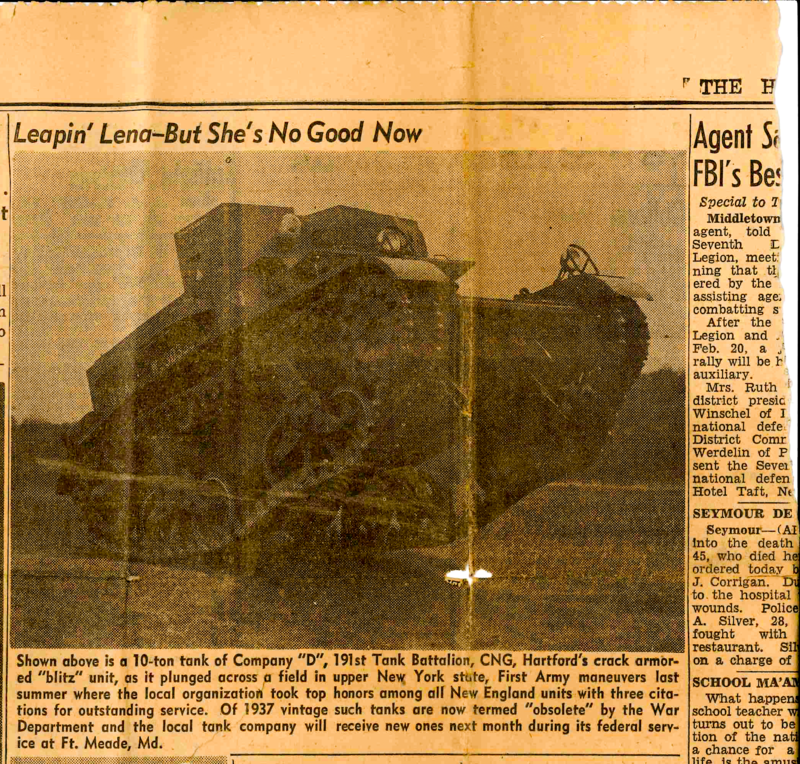 Right now we have only 16 very old tanks in the Battalion, We are going to Louisiana and Texas and will be gone for four or five months. Lesson learned? “The less said about all meals, the better.” It’s also interesting that they were pitifully low on equipment at this point, and the Battalion couldn’t even get hold of a flag pole! The momentum of the mobilization of Connecticut military forces is now nearing its peak. Monday, February 17, Company D of The 191st Tank Battalion entrained here for a year’s training at Fort George Meade, Maryland. 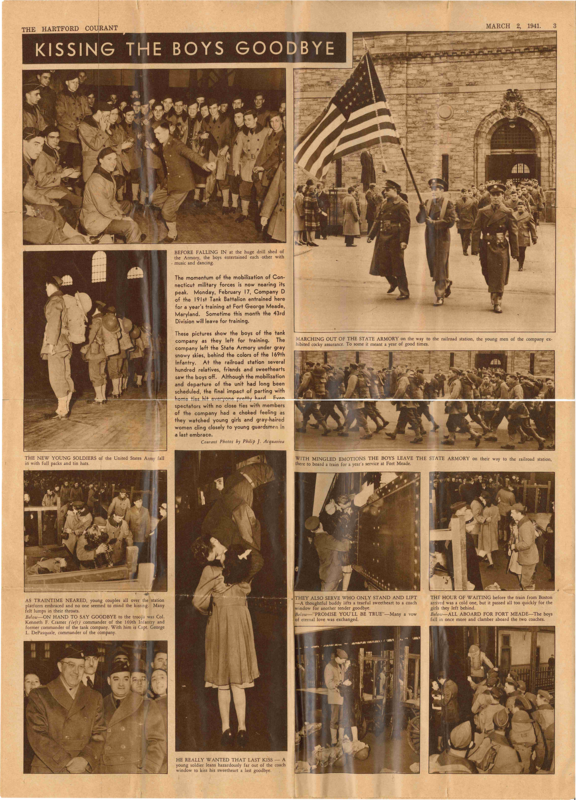 Sometime this month the 43rd Division will leave for training. 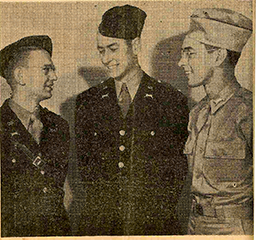 These pictures show the boys of the tank company as they left for training. The company left the State Armory under gray snowy skies, behind the colors of the 169th Infantry. At the railroad station several hundred relatives, friends and sweethearts saw the boys off. 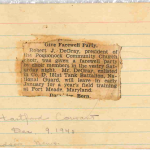 Although the mobilization and departure of the unit had long been scheduled, the final impact of parting with home ties hit everyone pretty hard. 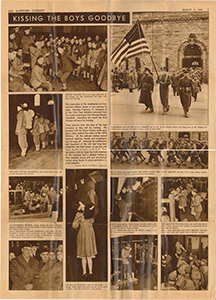 Even spectators with no close ties with members of the company had a choked feeling as they watched young girls and gray-haired women cling closely to young guardsmen in a last embrace. For some, it would be the last embrace. 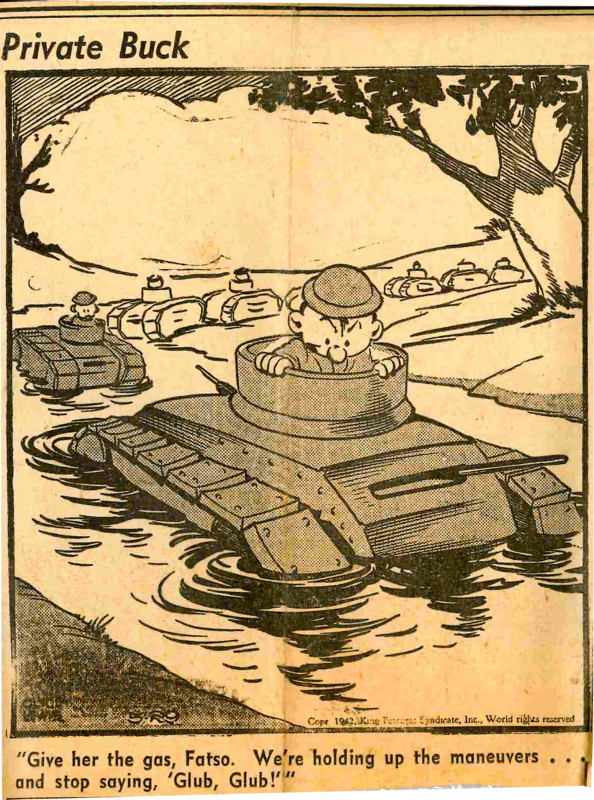 The first tanks issued to the batallion. 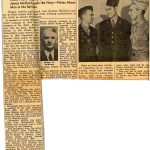 The local paper (Hartford Courant) reports on Dad (left) becoming an officer.